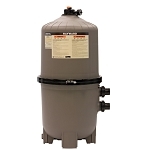 How Do I Choose a Pool Filter? Each filter has its own advantages and disadvantages, so how you choose one depends on how clear you need the water and how much time and energy you want to devote to the filter. Sand Filters are very good for areas where thereâ€™s a high amount of dust in the air, where you have to constantly flush the filer. The downside to sand filter is you lose a lot of water when you backwash, which can be a problem in areas where water is scarce. 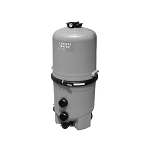 In addition, these filters only remove particles as small as 25 to 50 microns. 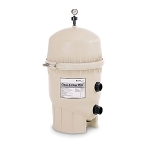 D.E Filters can filter out particles as small as 3 to 5 microns, but comes at a cost. Water filtered with D.E. is absolutely the clearest water you can get. However, D.E. Filters often require the most time and effort to service and clean and it also requires backwashing and re-charging the D.E in the filter. Cartridge filters do not get the pool water quite as crystal clear as D.E. filters since they filter particles as small as 10 to 15 microns. But they are a lot easier to maintain than D.E. filter, and thereâ€™s no backwashing involved in cleaning them. Plus depending on usage, some large capacity cartridge filters allow the homeowners to go a whole season before cleaning.